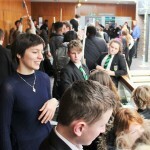 Following on from the success of last year’s View Finders outreach project, this year KSA has been working with 5 partner schools (Canterbury Academy, St Anselm’s, Folkestone Academy, Brompton Academy and Community College Whitstable) on a project entitled ‘Drop It!’ with over 70 students and 15 KSA student ambassadors. The previous year we worked with 6 schools and approximately 60 students. 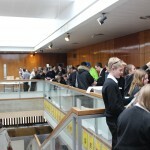 As with last year’s View Finders project, the aim is to introduce school students to architecture and to encourage them to be aware of the built environment as a possible future profession. This year’s brief is to design a box that can be dropped from an aeroplane into war zones or countries that have experienced a natural disaster. The box will open up, parts connected and assembled to form a number of ‘buildings’: a clinic, an orphanage or a dwelling. 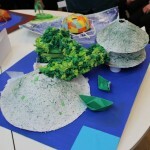 Students were asked to draw their ideas and make models over the course of the 6 weeks. The first of six sessions with our KSA student ambassadors began on Monday 25th January, and ran until Monday 14th March 2016. 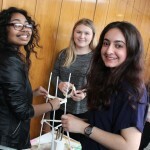 On Wednesday 16th March 2016, students from five schools within the local area arrived at Kent School of Architecture (KSA) to test their tower building skills and find out the much anticipated results of the Outreach Drop It! challenge. Pupils, teachers and parents alike filed in to the Digital Crit Space at KSA for a warm welcome from Rebecca Hobbs, Outreach Project Officer, where they were briefed on the itinerary for the day. Thanks were given to all those who were involved in the project. Patrick Crouch, Design Tutor at KSA, quickly put the budding architects to the test with his challenge to build a “Tower in an Hour”. 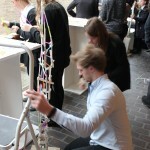 Armed with copious amounts of art straws, sticky tape and other materials, the teams set to work and built some impressive structures with guidance from Kent School of Architecture’s student ambassadors. Each group had a different approach to the tower but all had the same goal in mind: build the sturdiest, tallest tower in just 60 minutes. St. Anselm’s sought victory with their unique approach to the tower (which included a ball of string as decoration at the tip). After refuelling with some much needed snacks and refreshments, Rebecca and Patrick announced the proud winners of the Drop It! Challenge. Student ambassadors had been working at the schools to help the pupils to design a box that could be dropped from an aeroplane into war zones or countries that have experienced a natural disaster. 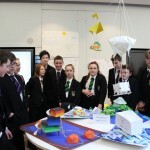 The resulting models were displayed in the Digital Crit Space, showcasing the different approaches that each school had taken. 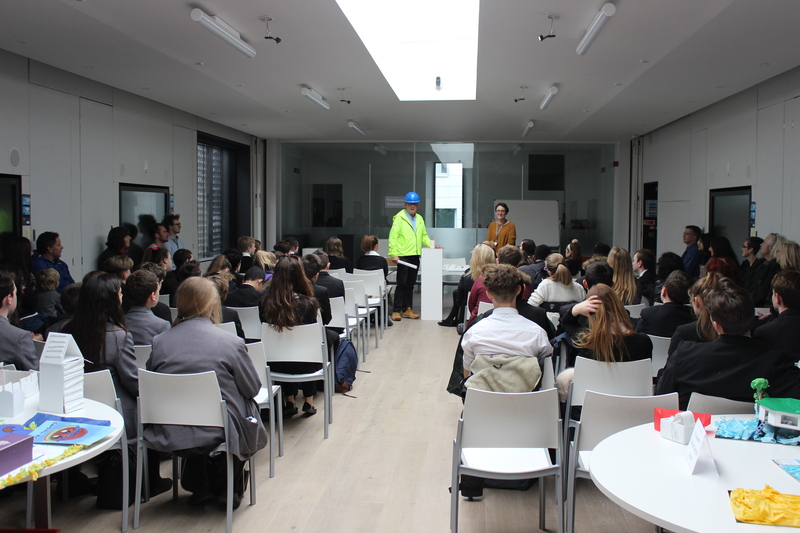 The winners, St Anselms, proudly accepted their prize from Rebecca Hobbs and as the event drew to a close, the students were left feeling truly inspired by their visit to Kent School of Architecture, the ambassadors they had met and the challenges which they had approached with vigour.